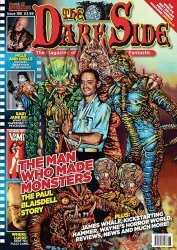 MyMovieMonsters.com > Monster Magazine Marketplace > Dark Side, The (UK) > The Dark Side #189 The Lost Boys - UK's Mag of the Macabre - from the UK! The Dark Side is the U.K.'s magazine of the macabre, covering and reviewing horror films around the world. 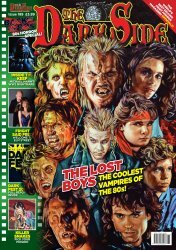 This is issue #189 - The Lost Boys! The Dark Side goes back to the '80s covering one of the coolest vampire movies of that era, The Lost Boys. You can meet Kiefer and the gang inside along with many more '80s favourites including Fright Night, the Elm Street series, and Michael Mann's cult spooker, The Keep. Other great features include Killer Snakes and James Whale, too, plus a flavoursome report from Dark Side's very first DarkFest, so don't miss this one! Missed Issue #188? Use the convenient Buy Both button below!